The last two days I've started to feel the strangest sensations on the (previously) numb part of my chin. Whenever I drink cold water, it feels like the outside of my chin is wet! This gives me the uncomfortable sensation that water is seeping out from inside my mouth to the chin via osmosis. I have to check every so often to make sure that, no, my chin is not a permeable sponge this time. Work is going alright, still having trouble getting back into the right mindset, but each day it gets a bit easier. 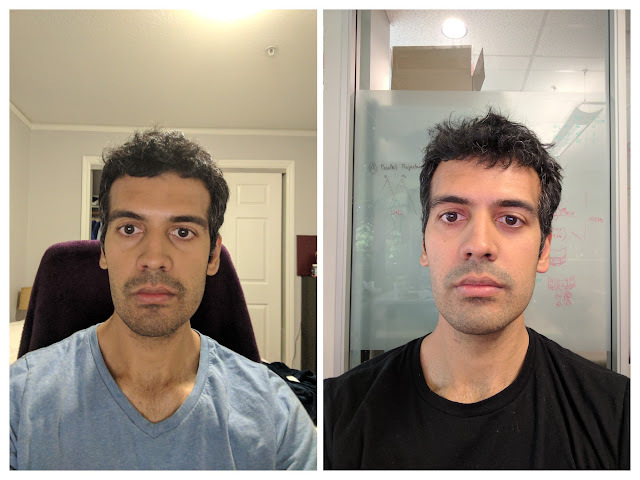 6 Week Check-In (Day 38-42) : Back to work and exercise! Yesterday was my first day back at work! It went well, almost everybody said I looked exactly the same, except I'd lost some weight. This is great since this wasn't a cosmetic surgery, and that means that my swollen face is only noticeable to me and those who know me closely. I also got the go-ahead from my surgeon to do weightlifting and rowing again, so now I have no excuses to slack off. I can also chew on whatever I feel comfortable with, which is still at the lasagna stage, as my teeth and jaws are sore from all the elastics. I tend to eat ramen noodles a lot lately, using chicken bouillon to give some flavour to the soup. 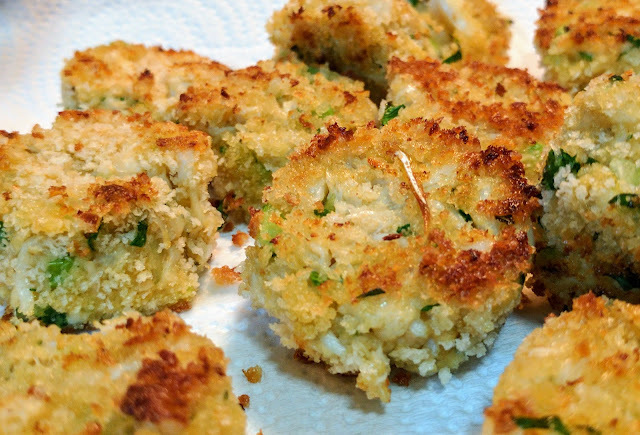 Mashed potato mixes are also great. I can eat most meats now, I just have to cut the pieces up a lot, and chewing gets tiring. Over the last 4 days, my face felt about the same, I've been eating more food outside with friends, getting more and more adventurous in my diet. 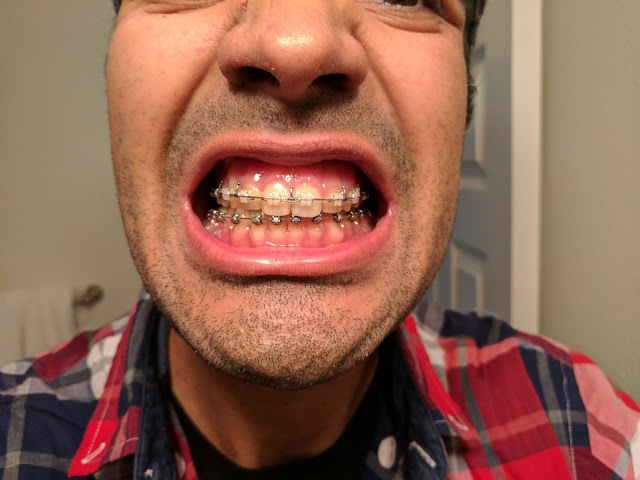 The orthodontist visit today was routine for checking how my bite was progressing (the last visit was even more boring). They were pleased with the progress on the left and front teeth, where it seems to be fitting at 100% already. The right side back teeth (molars) still have a larger gap, so in addition to the elastic there to help it move together, he removed the lower wire and replaced it with a thinner one. This allows for more movement of the lower teeth. The most exciting part about having the lower wires out was... the new wire didn't have any surgical hooks in it! Now, yes, they did add some wire hooks to the lower brackets itself, so that the box elastics could still be done to the teeth, but it is awesome to have removed the obnoxious hooks directly in the front and sides that used to be there from surgery. Energy was around 80%, I can do everything, I just like to complain about it.I still couldn't sleep side-ways comfortably (too much blood-pressure in face)Could walk at full speed up/down-hill, but when I got tired I got tired like I needed to sit down or I'd black out.Leaning over to pick up things is doable, but only for short stints. No yoga, not that I do yoga. Energy around 90%, I can do everything, I get mild headaches from too much exertionI am now able to lie sideways for an hour at a time without feeling too much pain, sleeping sideways is just barely uncomfortable enough that I don't do it right now.I can lean over for several minutes now without feeling a head-rush.I finally feel safe to do weight-lifting again, though I am supposed to wait for 6 weeks so I'll wait. 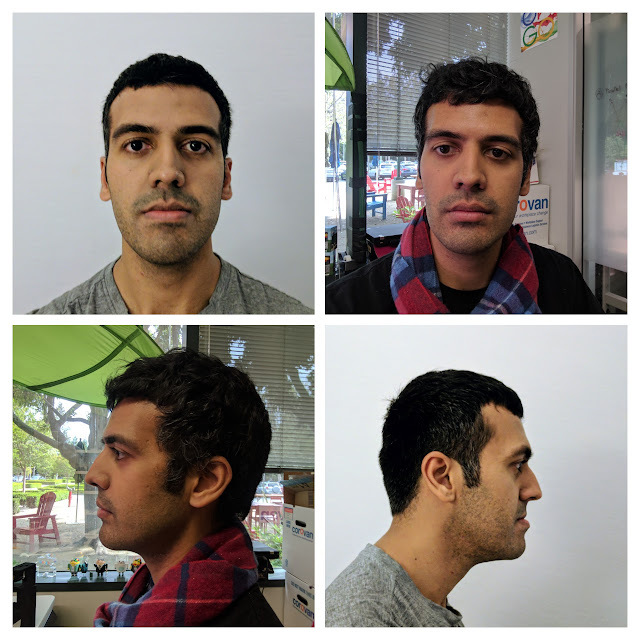 Here's profile photos from before surgery and 5 weeks. I just checked and it looks like all the visible parts of my stitches have finally dissolved. Over the last 2 weeks My lower stitches had dissolved (located at back of mouth where wisdom teeth were, and along the lower sides) quicker than my upper stitches (located above front teeth mostly). This is probably because they had more contact with saliva due to gravity. I'm pretty excited to see the upper stitches go because they were pretty painful pushing on the swollen skin, leaving an indent and causing swelling. 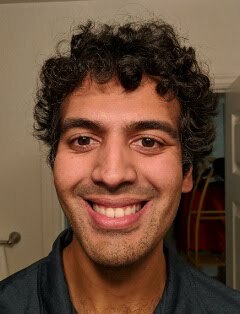 I felt like now was a good time as any to make a timelapse video of my teeth showing how the braces moved the teeth around from the start all the way to jaw surgery and a little bit past. Once I finish my braces I'll post an updated video too. I'd say my most bruised/painful feeling spot is probably right above my lips on the outside, pushing there just feels like I'm ripping something. Now it just feels like it's bruised, so a nice step up. Today marks 1 months since the surgery (30 days). 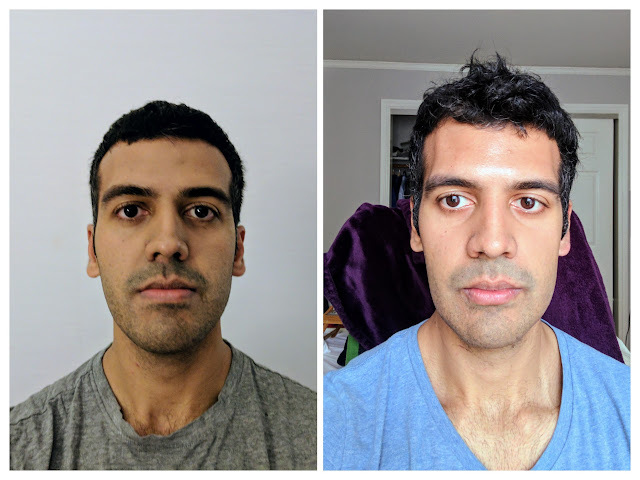 Comparison photos time. Here's a link to all my Check-In posts here also. It sounds cliche since I've read it on several blogs, but I really am amazed at how my body has recovered in that time. My bite has finally started to come together, and I feel comfortable saying it's better than where it was before surgery now. Considering I still have several months of braces to go perfecting to bite, it's all gravy from now on. Sleeping last night with the elastics was a struggle. There was just a constant dull pain from the pulling on a few teeth in particular. This morning was much better. I had one scare, where as I was swishing mouthwash I sneezed automatically through my nose. I had a moment of sheer panic; Did I just release the blood valves to my untimely demise? After a few seconds, some snot came out. So it turns out I'm okay. 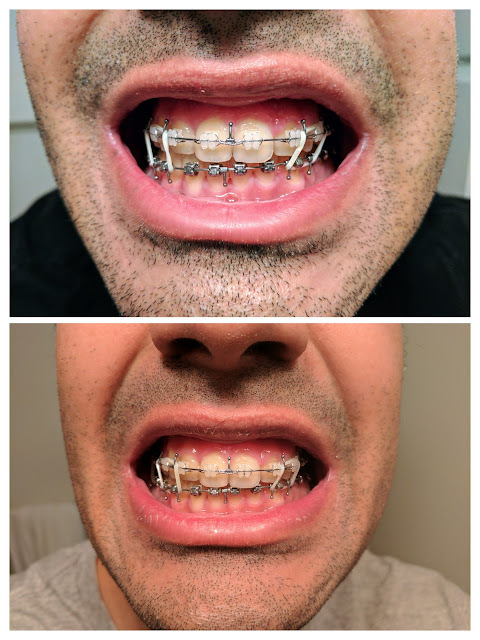 I've been wearing the elastics pretty consistently since my orthodontist appointment. My bite is definitely starting to form. 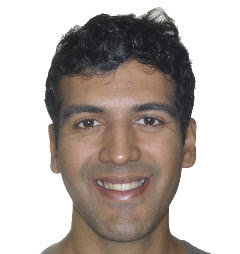 Whereas before I was complaining about contact on one tooth, now I can complain about uneven contact on several teeth :D, a nice step forward. Comparing from about 2 weeks ago to now, my bite has closed by what seems like 1-2 mm. In fact the teeth are starting to overlap/touch the metal brackets. 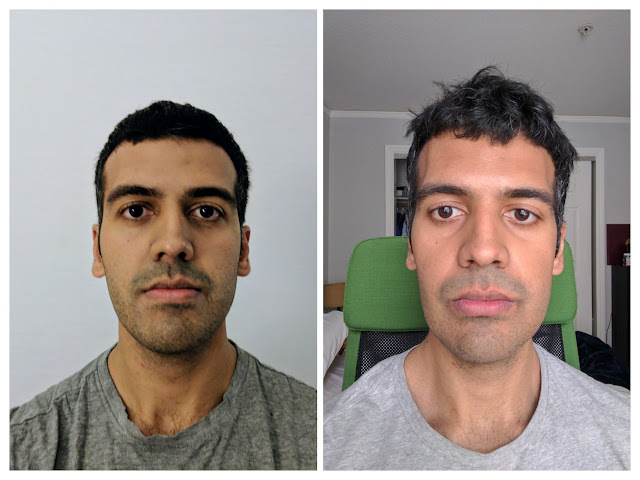 My left side teeth seem to be coming together nicely, but my right side is still lagging (left side in the photos). This is probably in part due to the slight cant to the teeth/jaw, and partly because of that one tooth that was holding up the line. When the orthodontist shaved it down a little that helped the teeth know whose boss and they have started to line up quickly. 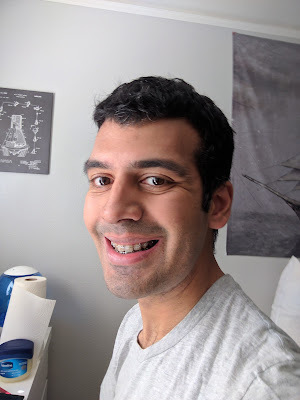 There is still a constant and annoying tooth and jaw pain from the elastics forcing my bite together in a new and uncomfortable way. I have more comparisons at my 4 week check-in. A few friends and I were discussing how a recent article on a shooting in the city was bereft of details. The article said someone was found shot in the afternoon. I was bored enough to create a potential story for it. These last two days my energy continues to return, I can walk at normal speeds now. My mouth is opening much wider thanks to the jaw exercises, at about 1.5 fingers now. This makes brushing much, much easier, since the toothbrush can fit inside the mouth fully, whereas before I had to kind of angle it in several places just to fit. This is still the baby toothbrush, the other one is still too big. 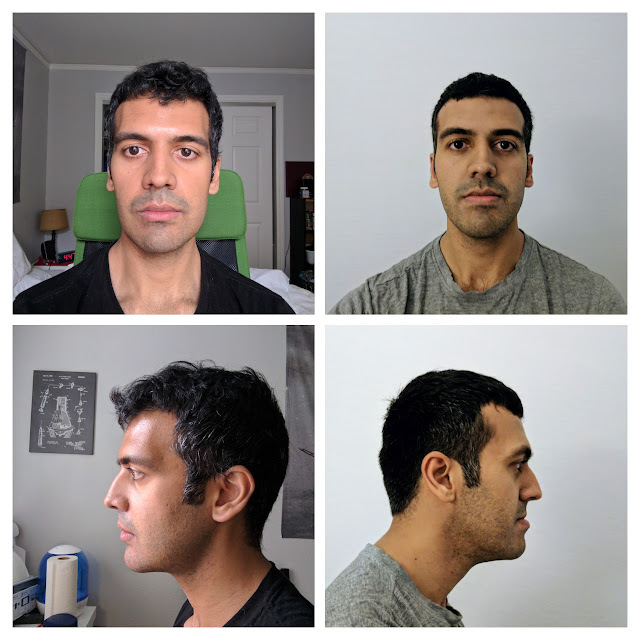 An interesting aside with my new jaw position is how it changes a lot of things I used to take for granted. You know how when brushing you spit out what's in your mouth into the sink after you're done? The first time I tried doing that, my spit went in the wrong direction. My muscle memory for pursing my lips is completely off now. Luckily nobody saw the results of that mistake.